In a City for All, everyone has access to safe and affordable transit so they can access jobs, services and participate in their communities. · In the last five years, transit prices have increased a lot more than the inflation rate. · Since 2008, transit fares have increased by 40%. 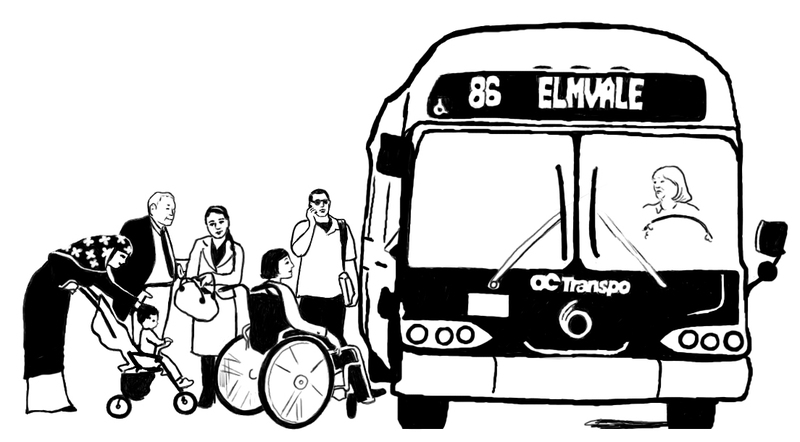 · Since 2011, OC Transpo ridership has fallen by 6.7%. · With higher transit fares, some women end up walking in unsafe situations or remain isolated at home. · EquiPass is a monthly adult pass for people living on low income, but it is still unaffordable for many. · In a City for All, everyone has access to safe and affordable transit so they can access jobs, services and participate in their communities. · Will you reduce EquiPass fare from $58/month to $43/month no later than 2019? · Will you freeze transit fares to make them more affordable for everyone?